When Napa Valley's famed slow food/fast food burger stand opened a branch at the Ferry Building Marketplace, the lines started forming before you could say, “Do you want fries with that?” Gott's offers ten different burger variations made from a hefty 1/3 pound of Niman Ranch Angus beef cooked to juicy pink perfection, as well as veggie, Diestel Ranch turkey and ahi tuna burgers. Try the classic cheeseburger or go rogue with a Western Bacon Blue Ring, topped with blue cheese, bacon, pickles, barbecue sauce and an onion ring; or the green chile cheeseburger with grilled Anaheim chiles. Definitely round out the meal with an organic Three Twins ice-cream shake or float—followed by a nap. 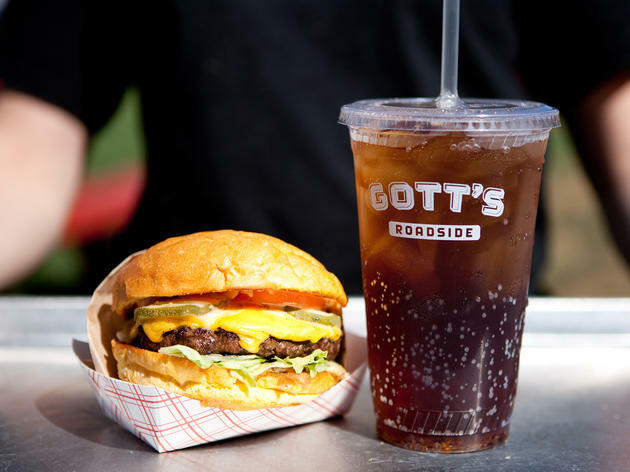 I absolutely loved Gott's, from the friendly service at the counter to the backyard picnic area that makes it feel like you're hanging out in someone's backyard. The milkshakes are really, really good, as are the onion rings and burgers. And though the line may snake around the outside fence, it moves fairly quickly. This is the cutest little roadside burger stand there ever was. The line is long, but not daunting—it moves fast and give you time to peruse the impressive menu and take some photos of the place. The food is fast, delicious and usually eaten on the bright red picnic tables out back, making it feel like a leisurely summer day, even if it's not. 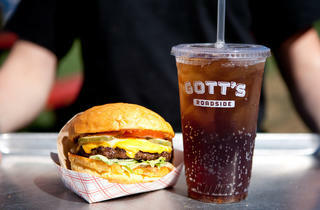 Gotts is absolutely the best place in the ferry building. Their burgers are big and delicious, as are their sweet potato and garlic fries. The outside seating area is great on nice days at anytime during the week. On the weekends though, the line will get really long, and you may have to wait a little while, but it will be worth it. Caution: it is guaranteed you will leave this place full and in need of no walking, which makes it good that the muni cable car things run really close to Gotts.